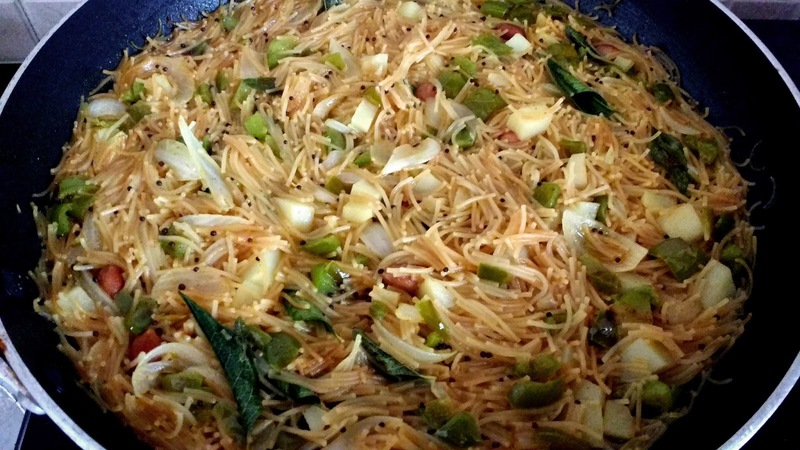 "Vegetable Vermicelli" is one of the most common recipes usually made as breakfast in Indian homes. 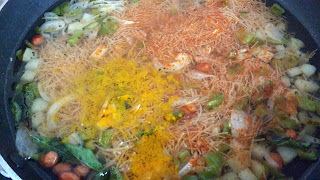 It is prepared using vermicelli, vegetables and few spices. 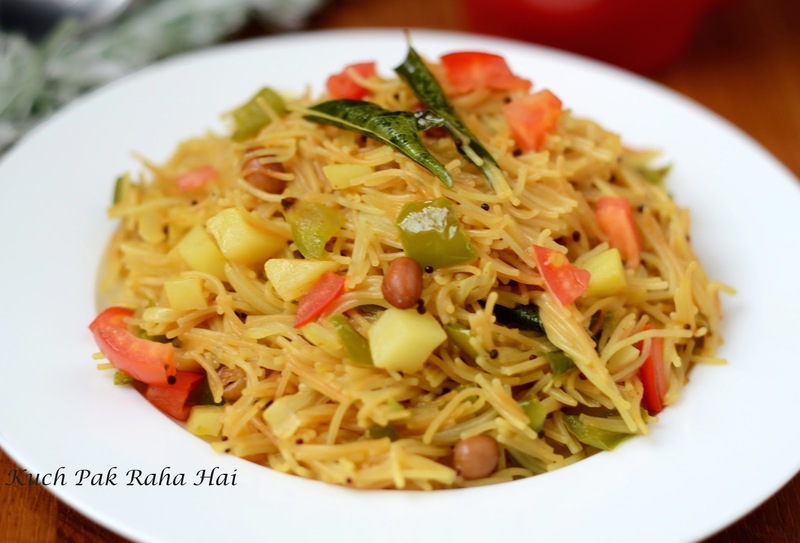 People call it with different names like Vermicelli upma, Seviyan Upma or Upma Pulao. 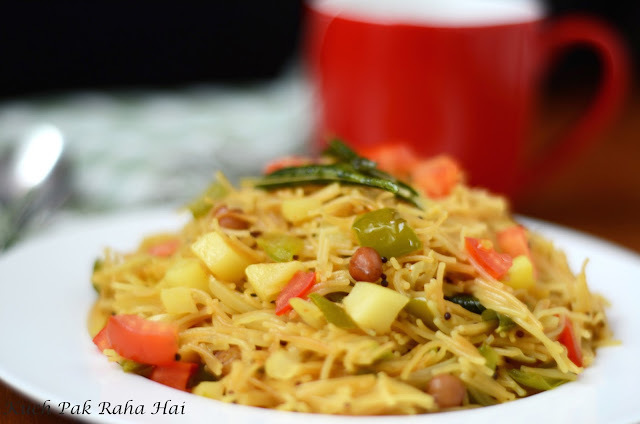 This dish is quite healthy, tasty and looks absolutely delightful. It is easy to make and takes very less time too. You can also give this dish in kids' tiffin by adding veggies or nuts of their choice. It is a complete meal in itself combining the goodness of grains, vegetables and nuts. Roast vermicelli in a heavy bottomed pan on Medium flame till they turn golden brown in colour. Heat oil in a pan and fry onion till golden. Take it out in a plate. In the same pan, shallow fry potato and capsicum. Keep them aside too. In the remaining oil, roast peanuts on low flame till they become slightly brown in colour. 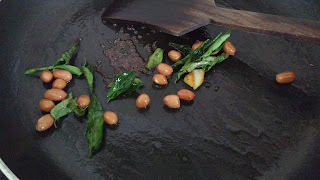 Add mustard seeds, carrom seeds and curry leaves. Mix well. Add sautéed vegetables and roasted vermicelli to above pan. Add water, salt, red chilli powder & turmeric. 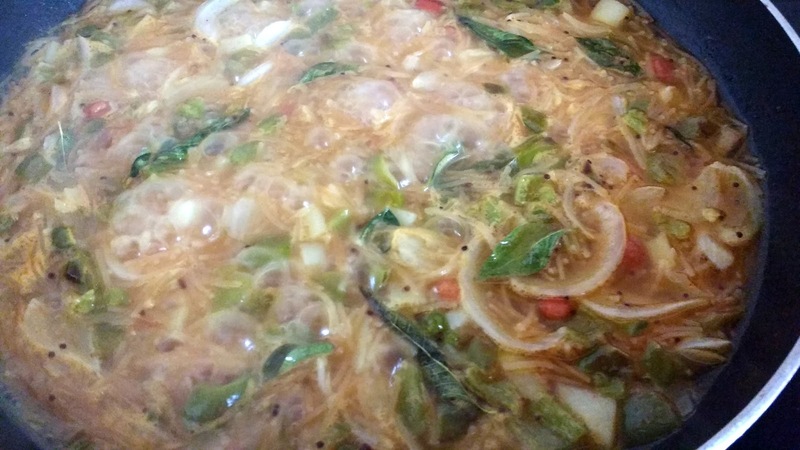 Gently stir so that spices are mixed evenly in water. Cook on medium flame till water starts evaporating . Once water level is reduced, cover the pan with a lid and cook on low flame till vermicelli is completely cooked and water is absorbed. Take it out on the serving dish. Squeeze lemon and garnish with chopped tomatoes and coriander. Enjoy hot steaming bowl of vermicelli with your cup of tea or coffee! !